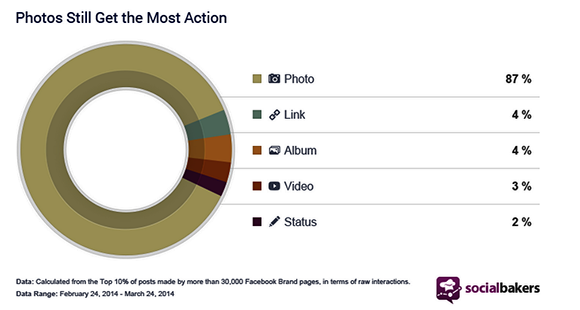 Ever wonder why a Facebook post goes viral? So I broke down several viral posts to find the key ingredient. The result might surprise you: Facebook quizzes! 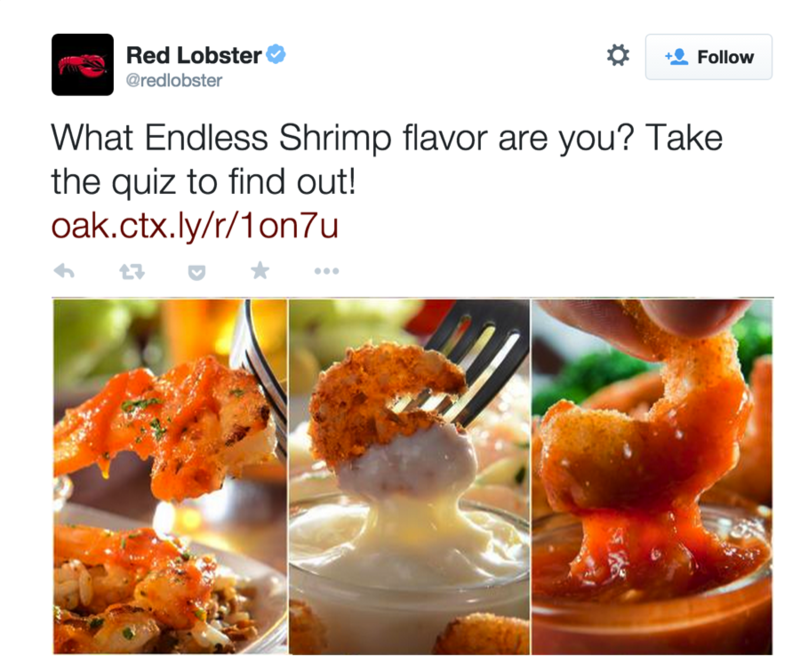 Next day -- the quiz post began to surge in popularity again: 110,000, then 120, then 130 -- all the way up to 179,000 Likes, the most-engaged Red Lobster post ever! How in the world did this happen? 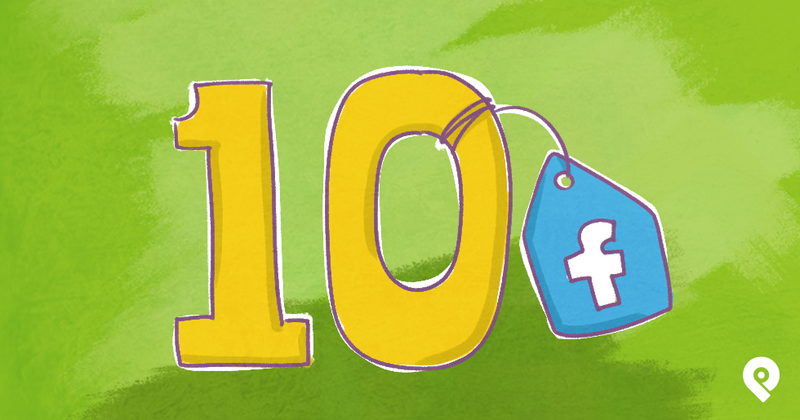 And how can you do the same thing on your Facebook page? Don't worry, I'm going to show you! 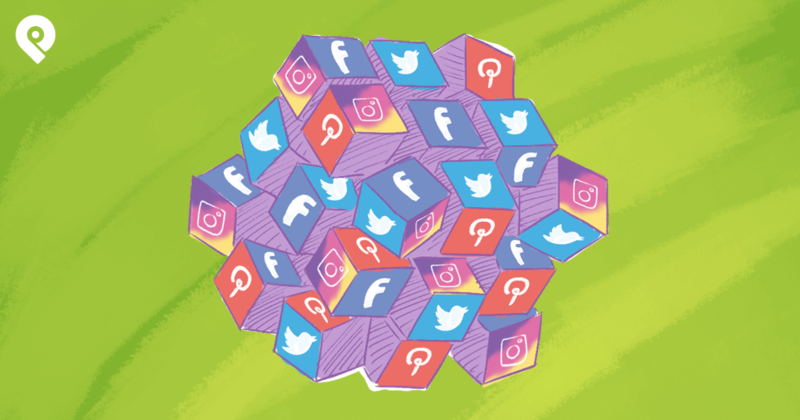 Read on to see how the companies below used Facebook quizzes to gain attention and traffic -- and how YOU can do the same! 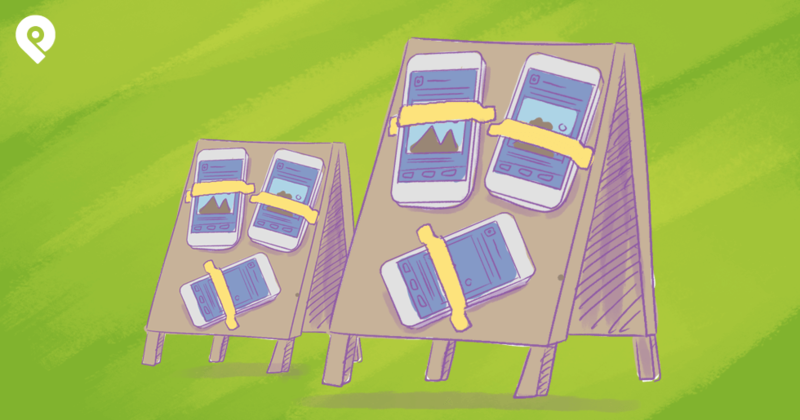 Let's first talk about why quizzes bring your audience closer to you. 1. Facebook Quizzes build an emotional connection. Emotions play a BIG role in what we decide to share. That's why the simple back-and-forth exchange of info created by quiz questions is enough to elicit an emotional response that encourages sharing. Consider this example from my collection of Facebook quizzes (see the graphic). Do you see where completing this relatively inconsequential statement builds a bridge between the author and the respondent? It's like meeting someone new: Now that person is no longer a stranger. The relationship has changed. I know something about you. Posts with images get shared more than posts without images. 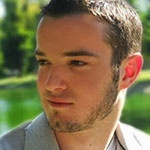 You don't need a case study to prove that (just take a look at Facebook or Google+ for proof positive). For those who want confirmation of the obvious, though, Social Bakers tracked thousands of brands on Facebook for a month. PRO TIP: Why did I say "Read and weep"? Most marketers (SME puts it at 58%) say written content is more important than visual content. I'm not advising you to fire your copywriter -- but you WOULD be wise to make plentiful use of graphics to break that copy into smaller, more digestible chunks. 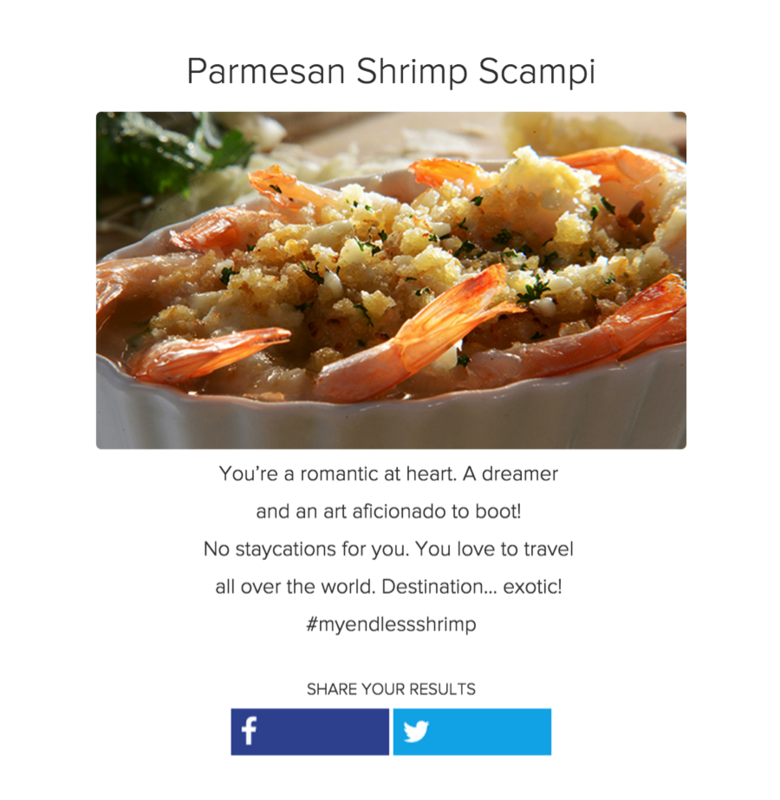 When you write a quiz, you get to give each participant a personal assessment of his or her results (even if that does mean just matching people with shrimp). How they possibly derived all that from my answers to 6 questions, I don’t know, but somehow I really want to believe their assessment is true (that's where the narcissism comes in). Not only that -- but Red Lobster provided a social share button so I could tell the world how cool they say I am. Yeah! Check it out! Red Lobster endorses ME! You're a complete idiot who should stay home and eat peanut butter. You have zero class, are totally self-centered and your breath smells of elderberries. Do you get the point here? With a quiz, you can charm their socks off and give them a reason to brag -- then you can ally yourself with them. But it's not YOU blowing smoke to get on their good side... it's the genuine scoop straight from THE QUIZ! The quiz (of course) is always right! Every smart marketer wants to know ONE THING in particular: What does this mean to my bottom line? Can quizzes help me acquire new customers or sell more of my goods or services to current customers? Let's look at results from 3 companies who got right down creative. These are regular companies, just like yours, that have used a quiz to sprout real and rapid returns. 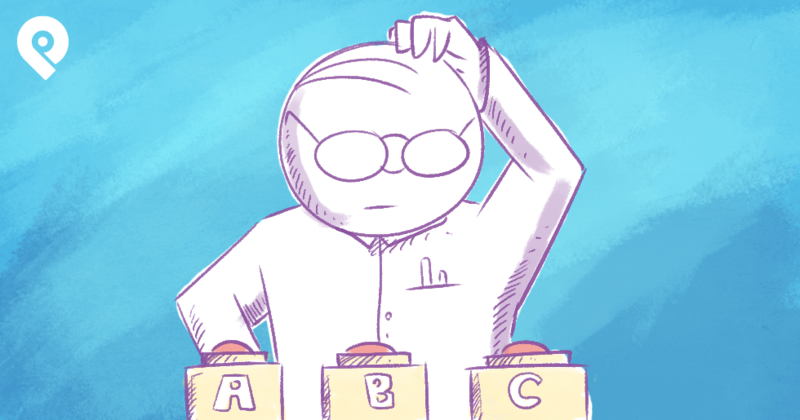 If you want a direct route to revenue, use a quiz. That's what The Elephant Pants did, successfully pre-selling $8,430 in product using the power of a well-shared quiz. 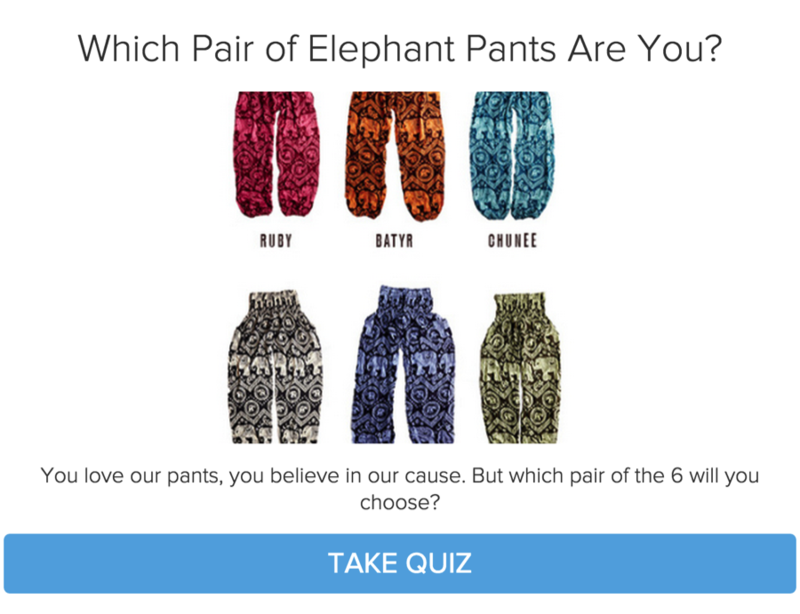 Their quiz, “Which pair of Elephant Pants Are You?” helped the company get launched. The quiz asks a series of fun and image-based questions before telling you which kind of pants best match your personality. Of course there's a link to buy those very pants and an option to share your pants (along with your unique personality) on Facebook and Twitter. How you can do the same: This method is the same one used by Red Lobster. You take a variety of products and design a quiz to personalize the options. Look at your own products or services. How can they be tied to personalities? Whether you sell coffee beans or remodeling jobs, the principle remains the same. Build a way for potential customers to find out how your product or service best describes their lives (or their wannabe lives). Every online marketer knows "the money is in the list." Whether you agree or not, there's no getting around the fact that you must have customers to survive -- and you must have prospects in order to have customers. Those people are looking for a reason to care about your content. They are there to consume the best of what is offered. By presenting an appropriate quiz to the appropriate audience, you can build your list and you can make sales. If you can't do that you need to keep doing what you're doing right now: Read and study articles like this to find out HOW. The quiz was quickly shared 2,100 times on Facebook and quickly brought in 1,043 new email subscribers for the non-profit. How do you like them stats? That's better than a 50% conversion rate! PRO TIP: Notice the tactic here. 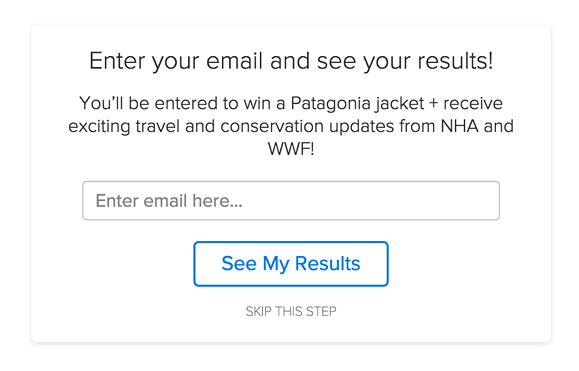 Participants MUST provide a valid email address before being allowed to preview the results. What? you say, "Look at the SKIP notification at the bottom!" Most respondents either don't notice that OR don't stop to worry about it. Entering your email address is something you probably do several times each day. It's no big deal. 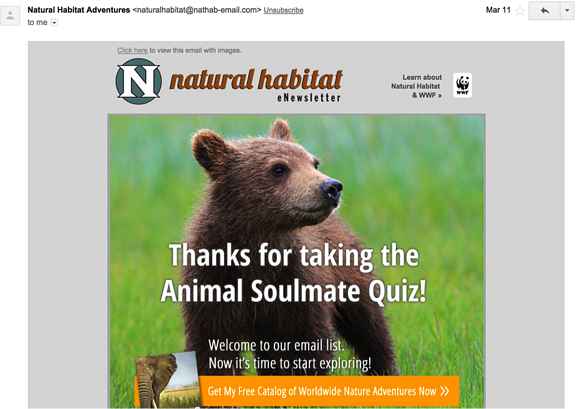 I subscribed when I took the quiz -- and I'm here to tell you, the email sequence you get afterwards is a world-class setup. Check it out for yourself. 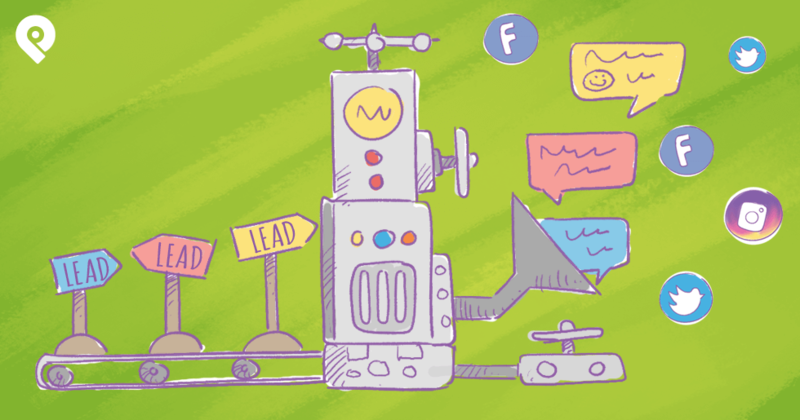 How you can do the same: You’ll need a couple of things to create an effective lead-generating quiz. 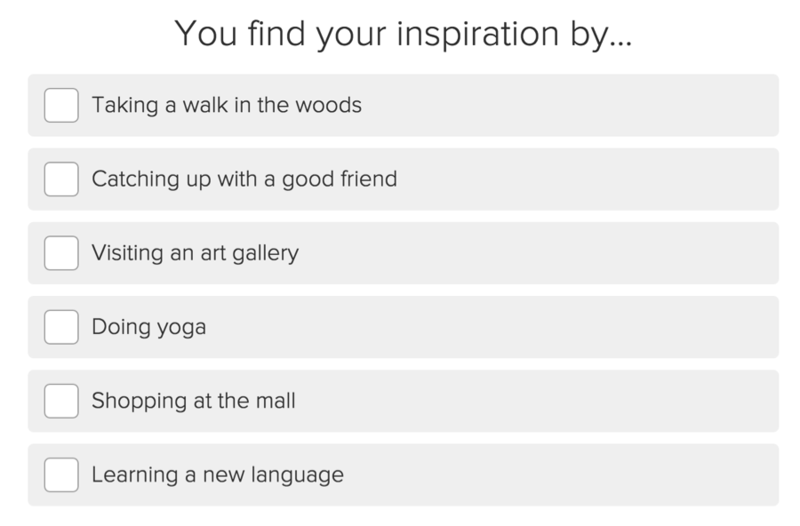 Design a quiz that hits all 3 of the power factors – emotional connection, images and feeding narcissism. 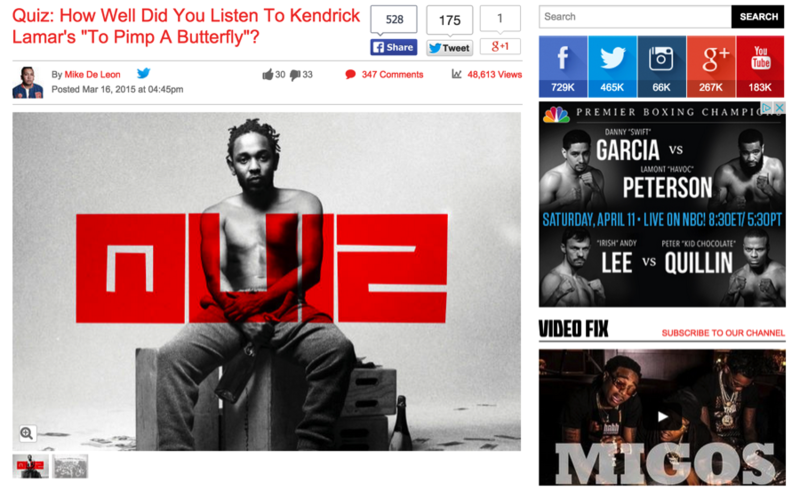 Hotnewhiphop.com (HNHH) created a quiz called “How Well Did You Listen To Kendrick Lamar's 'To Pimp A Butterfly?'" The move caused quite a stir on Facebook (in a good way). Here's the rub: You had to go back to the main website to actually take the quiz -- which meant PAGEVIEWS. To monetize that traffic, HNHH placed several ads on the quiz page (see the screenshot). That led to a 2% click-through rate, and at 75¢ per click the 46,613 unique visitors the quiz attracted earned HNHH $3,450 in commissions. Not too shabby for the hour it took to build and post a simple quiz! 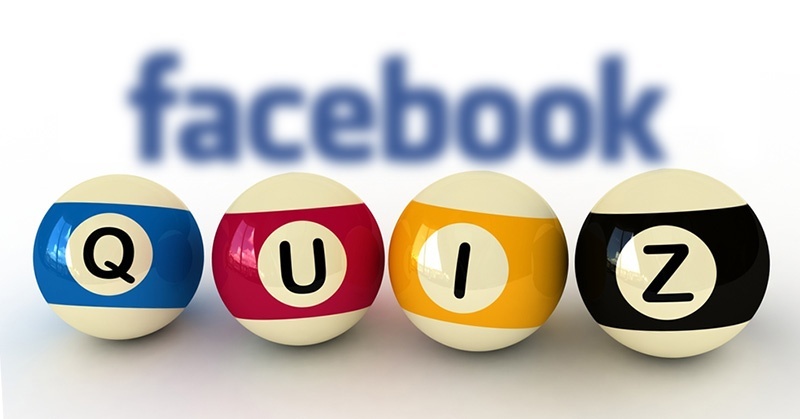 What can you do with Facebook quizzes? Once you've figured that out and your quiz is live, share a link in the Comments so I can help promote it. 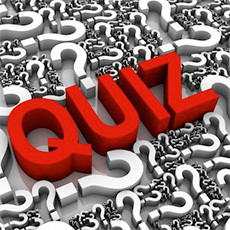 If you know of a deserving quiz someone else is running, share that too. After all, we're in this thing together. Let's help one another grow! Oh, yeah... you're going to need a tool to help create quizzes: Try Interact.